I made a few changes to the recipe for various reasons, and I figured I’d copy it below. 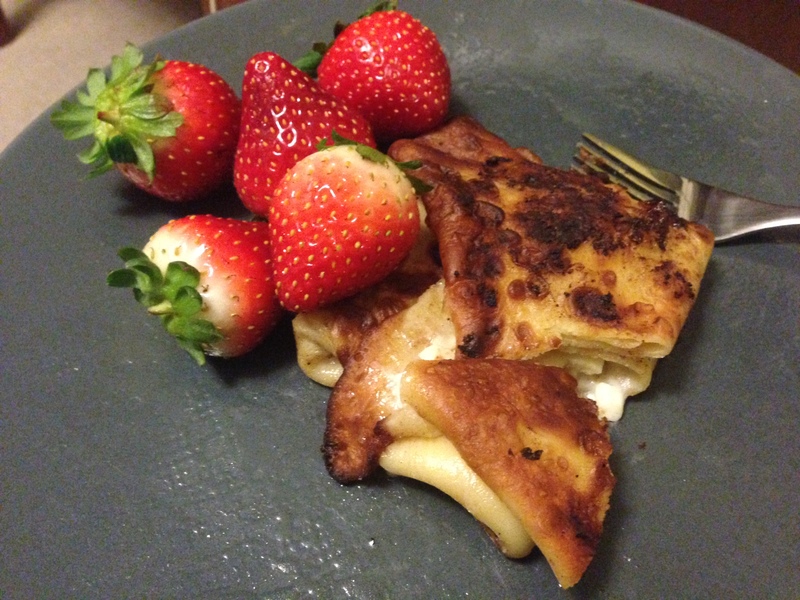 Basically, Nalysnyky and Blintzes are some sort of filling wrapped in a crêpe. I chose cottage cheese*** instead of the Ricotta and Creme cheese suggested by the original recipe. My proportions may be a little different, as well. I feel like there’s something slightly missing in the filling, but I’m not sure what it is. They were still a hit at Christmas dinner last year and this year. (Last year, S and I made ourselves sick eating them, but they were oh so tasty. 😀 ) Both last year and this year, I made a double batch. IIRC, this makes 15-18 blintzes, more than enough to satisfy 7 and leave many left over for snacks. This is a very forgiving recipe. You mix things in a bowl, the exact proportions don’t really matter, and you can pause partway through and nothing much will go wrong (assuming nothing is actively burning in your frying pan). The first time I made them, I had long pauses between steps (as it was my first time doing a new recipe in a long time), the second time, I only used a timer about 1/3 of the time, trusting in my ability to read butter cooking temperature (browns and crackles at 375 F), and how well done a crepe was. Thinking about it, if you wanted to do this assembly-line style, you could have two frying pans on the go, one making the shells, one frying the results. You could also use whatever oil suits you. We used olive oil the first time we made them, to good effect. 1) Mix all the crêpe shell ingredients in a mixing bowl. 4) Apply enough butter to the bottom of the frying pan/skillet to make a thin layer for cooking. You can tell by the fact that it is sizzling and slightly browning and coating the bottom of the pan. 6) Wait 60-75 seconds (I set my microwave timer for 55***** seconds), or until the crêpe can be flipped without displacing uncooked liquid on its top (If you wish, you don’t need to cook both sides of the crêpe at this stage, you can cook the inside, add the filling, then cook the outside later, which may save you 15-30 mins, if you’re really organized). 7) While this is cooking, take a sheet of wax paper, and get it ready to receive the crêpe. 8) Flip the crêpe, and cook the other side for 60-75s. 10) Repeat steps 4-9 until all the crêpe batter is exhausted. 12) Stir the filling ingredients in a mixing bowl. You may want to add different amounts than above, to taste. 13) Put a small amount (one spoon’s worth) of the filling onto the lower middle of one of the crêpes. Fold the bottom part of the crepe over the middle, then each of the sides in, then fold the bottom ‘pocket’ up until the crêpe is rolled up like a burrito around the filling. 14) Melt about 1/3 of a stick of butter into the pan (this should be enough to cover the bottom of the pan…Add more if you want to brown more of the nalysnyky during frying). 18) Serve warm, with fruit, or whatever other garnish you wish! *****I have a personal rule that I must press the fewest number of microwave number buttons whenever I program a countdown. This leads to interesting regions like 0:55, 0:66, 1:11, 0:77, where you get some nice overlap. Usually, though, it’s 0:33, 0:99, and 0:55. Made a double batch today. Added thawed frozen blueberries to the filling in the second half. Different flavour, but not necessarily better. Still don’t have a good solution for the blintzes opening up on the frying pan. Have to watch them really carefully, or they burn. Did all the timing by watching, things seemed to work out okay. Total elapsed time (once all materials were assembled and kitchen was clean): 1h33mins. – The line between ‘pan not quite hot enough’ and ‘looks burned afterwards’ is pretty narrow, and is very close to exactly halfway up our back large stove burner. – For cooking the filled blintzes, ~60s seemed to be plenty. Also, four seem to fit in the pan, if they’re 1/3 cup of batter blintzes. – How cooked the crepes are before putting them on the wax paper seems to be really important. If they’re cooked enough so that one side is browning, that seems to be enough so that the not-as-cooked side doesn’t stick too much to the wax paper. If they’re not browned, then it seems to be an issue.